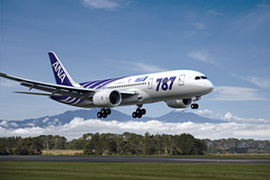 On October 26, 2011, the next-generation, medium-sized passenger jet, the Boeing 787 Dreamliner, successfully made its first commercial flight between Japan's Narita International Airport and Hong Kong. The body of the 787 is made with carbon fiber composite materials, replacing metals such as aluminum alloys that have been used up until now. Carbon fiber is a material composed of fibers made almost entirely from carbon, produced by applying a special heat treatment to acrylic fibers and pitch, which is a substance that remains after the distillation of crude oil, coal tar, or other substances. Per kilogram, carbon fiber possesses 10 times the strength of iron, and yet, with only one-quarter the weight, it is extremely light. 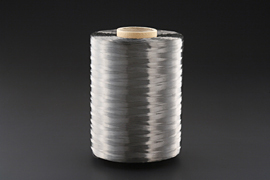 Carbon fiber also does not corrode or easily lose its shape, making it a highly useful material. Japanese companies produce about 70% of the carbon fiber in the global market, so this material can be regarded as a specialty of Japan. Today, carbon fibers are said to be a "dream material," but surprisingly, they were developed more than 40 years ago, when Japan began carbon fiber production for the first time in the world, in 1971. From the 1970s, it was thought that carbon fiber could be used in the bodies of airplanes, since it is lightweight and strong, but its safety had yet to be proven. To make it usable for aircraft, a leading Japanese manufacturer undertook the development of carbon fiber composite materials by making the fibers harder with resin. 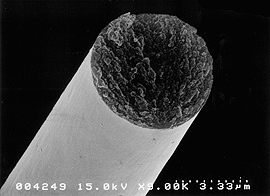 Since carbon fibers have a thread-like form, making them usable in practical applications required production of composite materials with resin added in a suitable manner for each targeted usage. The safety was tested for a period of more than 20 years, and carbon fiber now has reached the level in which it can be used in the bodies of airplanes. Carbon fiber composite materials make up around 50% of the weight of the Boeing 787. One may think that this figure is "only half," but since the material is extremely lightweight, in actuality, most of the airplane's components (except the engines, hydraulics, and other parts) that are visible are made with carbon fibers. Now this material is to be used in the Mitsubishi Regional Jet (MRJ), a Japanese medium-sized airplane soon to be marketed worldwide. Things Made with Carbon Fiber Are All Around UsCarbon fiber is not only used to make airplanes; it is also applied in structures for which a high degree of strength is essential, including wind power turbine blades, high-pressure gas containers, ships, and reinforcement materials for bridge piers and buildings. Indeed, it may seem as if carbon fiber is used only for making really large structures like these, but actually, because it is lightweight and strong, carbon fiber is also applied in smaller items that are used every day. Fishing rods are just one example. With its lightness and strength, carbon fiber is a perfect material for fishing rods, which require appropriate flexibility to sense a delicate pull on one's line. Carbon fiber is also used to make sporting goods that require both power and lightness, such as tennis racquets and golf clubs. In addition, it is expected that automobiles can be made more fuel-efficient by using carbon fiber composite materials in vehicle bodies to reduce the body weight. At present, these materials are only being utilized for vehicles that need to be exceptionally light, such as in the bodies of Formula One racecars. In the future, however, carbon fibers are expected to be used in commercially sold vehicles, and automotive manufacturers in Japan are developing prototype vehicles one after another.